Casimiro Ulloa hospital in the capital, Lima, said he was in surgery where he was being treated for "a bullet wound to his head". 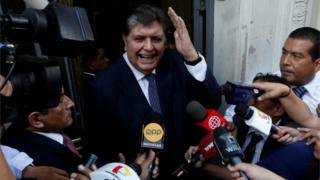 Mr García is accused of taking bribes from Brazilian construction company Odebrecht - claims he has repeatedly denied. Interior Minister Carlos Morán told reporters that when police arrived, Mr Garcia asked to make a phone call and went into a room and closed the door. Minutes later, a shot rang out, Mr Morán said. Police forced the door open and found Mr Garcia sitting on a chair with a bullet wound to his head. Health minister Zulema Tomás said Mr García's condition was "very serious and critical", and that he had to be resuscitated after suffering three cardiac arrests. "Let's pray to God to give him strength," the former president's lawyer Erasmo Reyna reportedly told journalists at the hospital. But Mr García says he is the victim of political persecution, writing in a tweet on Tuesday that there is "no clue or evidence" against him. Ex-leader Pedro Pablo Kuczynski was taken to hospital with high blood pressure on Wednesday just days after his own arrest in connection with Odebrecht charges.